Payment Instructions: Your credit card will be processed for the full amount of sale immediately following close of the auction (unless PRIOR alternative payment arrangements have been made with THCo). Please note: processing times may vary up to 24 hours following transaction. The online buyers premium is 15%. Please see additional fees noted in Shipping Instructions and Checkout Date & Time Details for item(s) not removed by date/time specified. Thank you for participating in a Thomas Hirchak Company Online Auction. BEFORE PLACING A BID: it is important that you are familiar with the terms and conditions as all sales are final. The terms of sale are non-negotiable. Buyer is responsible for all costs and fees associated with purchase - no refunds. 15% Buyers Premium, 3% Convenience Fee. Registration at the auction (online / in person) finalizes each bidder's agreement to the terms and conditions of sale as stated in the Contract and any Addenda which are incorporated by reference into your bidding. Do not bid until you have read and understand the terms and conditions. In order to bid at the auction, each bidder must be signed up and register to bid through Proxibid.com. There is no fee to register although a valid credit card will be required to verify identity and funds. By bidding you are representing to Thomas Hirchak Company (Auctioneer) and the seller that you have read and agree to be bound by the terms and conditions for this sale as stated herein. If you do not agree with any of the terms and conditions stated DO NOT BID or you will be bound by those terms and conditions. By bidding you agree to all disclosures. THE SALE WILL BE CONTROLLED BY THE AUCTIONEER PROGRAM. Thomas Hirchak Company is not responsible for malfunctions or system errors which cause a bid or bidder to fail to be recognized or registered. If there is a dispute, the Auctioneer may re-open the bidding at the Auctioneer's sole discretion and shall serve as the sole arbiter as to who is or is not allowed to bid. 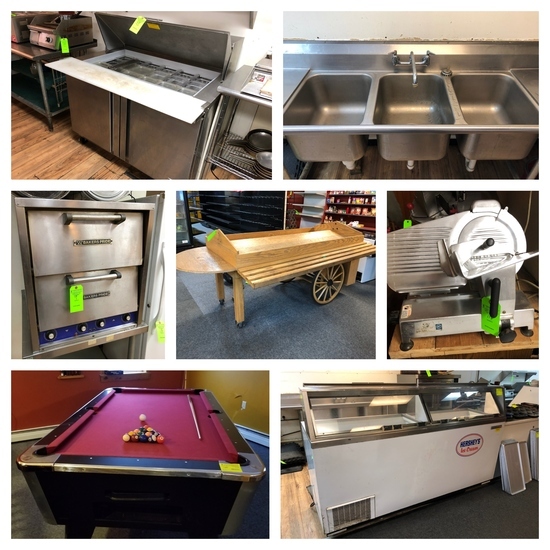 Equipment is sold 'AS IS, WHERE IS' with no financing, inspection or other contingencies to sale. Thomas Hirchak Company represents the Sellers only and does not inspect properties on bidder's behalf. Buyers must conduct their own due diligence and investigation of each property and must also investigate the suitability of each parcel prior to making a bid and purchase at the auction. Buyers must rely solely upon their own investigation and not any information provided by the Seller or Auctioneer. Failure of a Buyer to be fully informed on the condition of a property will not constitute grounds for any claim adjustment or right to cancel sale. YOU ARE ENTERING INTO A BINDING CONTRACT. THERE ARE NO REFUNDS OR BID CANCELLATIONS. THE REGISTERED BIDDER IS PERSONALLY RESPONSIBLE, LEGALLY AND FINANCIALLY FOR ALL AUCTION ITEMS BID UPON WHETHER REPRESENTING ONE'S SELF OR ACTING AS AN AGENT. AN ONLINE BID ACCEPTED AT PUBLIC AUCTION IS A LEGAL AND BINDING CONTRACT TO PURCHASE. ANY BIDDER WHO FAILS TO CONSUMATE A PURCHASE WILL BE BANNED FROM BIDDING AT ALL FUTURE SELLER AUCTION EVENTS AND MAY BE PURSUED FOR CIVIL AND/OR CRIMINAL VIOLATIONS. You've been outbid to u****e! to YOU! You've been outbid to s****c! to YOU! You've been outbid to R****g! to YOU!